SNICKERS® Brownies are fudgy chocolate brownies that are packed with mini SNICKERS®, caramel, peanuts and topped with milk chocolate gananche. This SNICKERS® Brownies recipe post has been compensated by Collective Bias, Inc. and its advertiser. All opinions are mine alone. 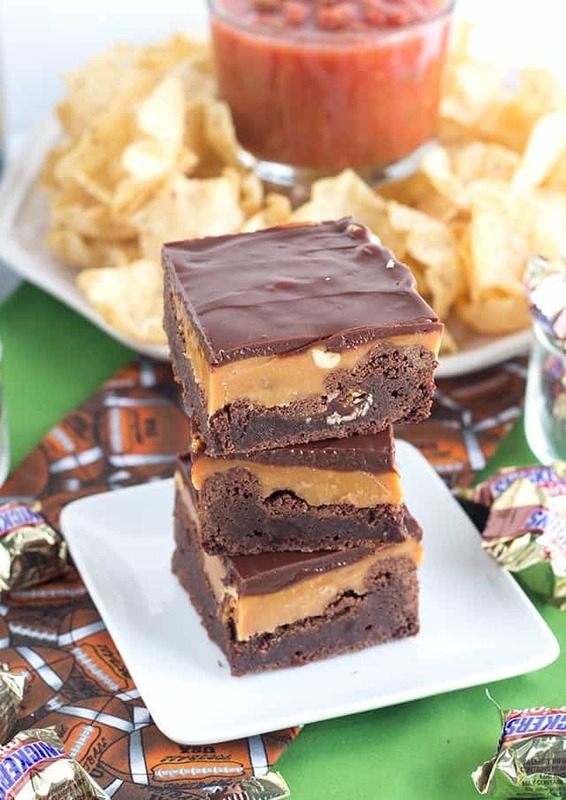 Your game day table is going to be kicked up with this incredibly decadent SNICKERS® brownies recipe. I love to have a good spread of snacks for game day. It’s mostly because I’m more of a snacker than a watcher of the game, if we’re being honest. Things like Buffalo chicken wings, warm cheese dips, and of course, desserts all help the game watching experience. Do you see how the caramel gets super thick on one side of the brownies? 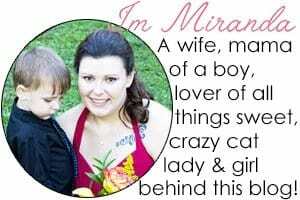 That makes me one happy lady. I remember one time my mom made me a birthday cake and the cake slightly sunk in the center, but she filled it with peanut butter frosting anyway. The frosting in the center of that cake was probably more than an inch thick and since I was the birthday girl, you know what piece that I requested. Same goes for these brownies and the thick caramel filling. The hubby is a football man though. That is if he can get the TV away from our 5-year-old teenager. Lucian’s glued to it. 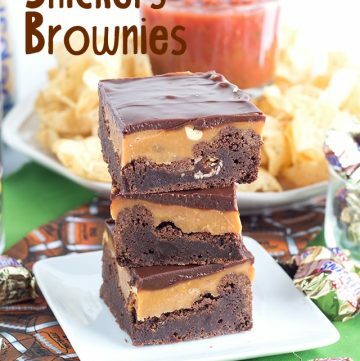 Since I’m such an awesome wife who knows he loves to eat sweets (not that I love to bake or even eat them or anything), I sometimes make him an equally awesome sweets like SNICKERS® brownies to go with his TOSTITOS® Scoops and chunky salsa. Sometimes I like to toot my own horn. Someone has to! While I was browsing the seasonal candy aisle at the store, I figured I would grab a few bags of candy for our football bash. I went with Skittles® and SNICKERS® Minis. Let’s not forget our beverages of choice. Mine happens to be Diet Pepsi™ and Wesley’s is just Pepsi™. That’s right, folks. We hit it hard on game day, can you tell? 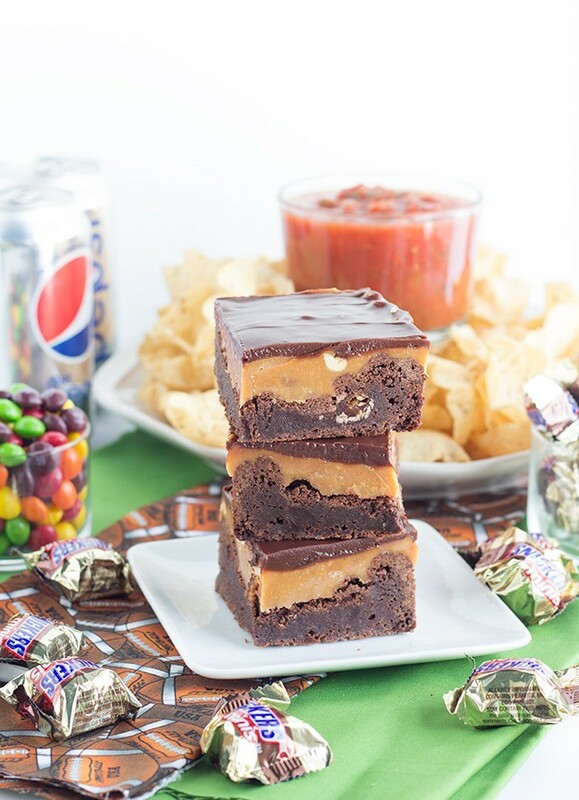 These SNICKERS® brownies are the perfect addition to the game watching party. Preheat oven to 350 degrees. Spray an 8x8 square baking pan with non-stick cooking spray. Line the bottom of the pan with parchment paper and then spray the parchment with non-stick cooking spray. In a microwave safe bowl, add in the butter and milk chocolate chips. Microwave for 1 minute. Stir with a spatula. Microwave 30 seconds and stir again. The chocolate should be melted and completely smooth. Let cool for 10 minutes. Add in the granulated and brown sugar, eggs, and vanilla. Using a hand mixer, mix for 2 minutes until the mixture turns pale and becomes thick, light, and fluffy. Add in the cocoa powder and flour and mix on low until almost incorporated. Turn up to medium and beat for about 30 seconds. Pour and spread evenly in the baking pan. Place 8 SNICKERS® Minis in the batter. Place in the oven and bake for 35 minutes or until done. Once done, remove from oven and add 8 SNICKERS® Minis on top of the first set of candy bars. Let the brownies cool completely. You can place it in the fridge to cool down faster. In a mixing bowl, add in the caramel bits and heavy cream. Microwave for 1 minute. Stir until the cream is incorporated into the caramel. Microwave for an additional 40 seconds. Stir until the caramel is smooth. Add in half of the peanuts and stir. Pour the caramel on top of the chilled brownies and smooth out. In a microwave-safe bowl, add in the heavy cream and milk chocolate chips. Place in the microwave for 30 seconds. Stir with a spatula. Place back in the microwave for another 30 seconds and stir. It should look like melted chocolate and completely smooth. Set aside and let cool until it thickens slightly. Remove brownies from the fridge and spread the ganache over the caramel. Be sure to get all the edges and corners. Place any sprinkles or decorations on top at this point. Place back in the fridge to cool completely. It should take about an hour. What does your game day feast look like? Do you go more on the sweet site or savory? I don’t have any dark Hershey’ s cocoa on hand, but I do have Drostes Ghiradhelli, Valhrona, and other such cocoa available. However, I will gladly buy dark Hershey’ s if you feel it is necessary for the flavor, as money is no object when chocolate is the issues. So should I substitute or buy??? Thanks! Hi Susan! It’s not necessary. Any unsweetened cocoa powder will do. I want one of these! Oh my :)) Thanks for the recipe!